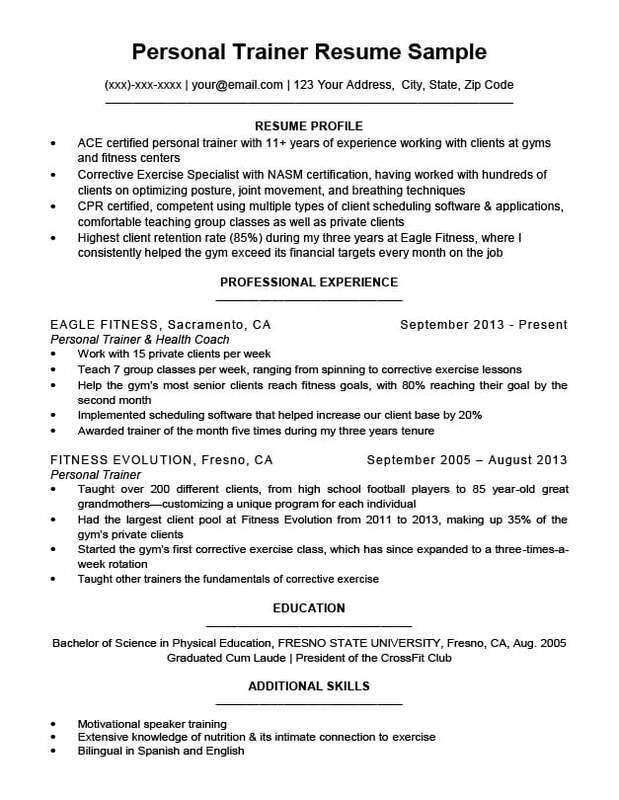 Our personal trainer resume sample and career-focused writing tips are valuable tools that can help you make your resume stand out amongst the competition! Just like a good trainer targets individual muscles and muscle groups, we’ve honed in on the key areas that will strengthen your resume and land you an interview. Or, if you are strapped for time, take our easy-to-use resume generator for a spin. Looking for a resume in a different industry? Check out our resume database. Not your ideal resume design? Find a resume template that best suits you. Need some more advice? Take a look at our expansive library cover letters for some pointers. 1. Certifications look fresh on paper. Use your resume to highlight certifications, personal achievements, areas of physical fitness you excel in, and your experience. Regardless of your actual ability to train clients, having concrete certifications will 1) open doors to teach classes, 2) increase your potential earnings, and 3) make you (and your resume) look professional. Successfully completing programs like the ACE personal trainer certification can help solidify yourself as a qualified candidate. If you’re qualified already, great — list your qualifications on your resume! If not, then think about some basic ones (like CPR & First Aid) and get them– they will go a long way in helping you land an interview. Some gyms will require particular certificates for a candidate to qualify, so keep that in mind when tackling the application process. If you are familiar with using specialized equipment, such as balance boards or balance disks (for rehabbing clients), this is great information to include in your experience section! 2. Use a resume profile to make a quick first impression. Next should be your area of expertise. This information is essential for personal trainers because their specializations and qualifications will often vary. Show the hiring manager quickly what your strongest suits are. Third comes your skill-set. That includes certifications and any skill you think is relevant to personal training. If you’re not sure what skills should be placed on your resume, our skills section guide is a good resource to check out. Finally put down your greatest achievements as a personal trainer. These should be focused on your ability to retain clients, your ability to help clients achieve goals (using numbers), the total clients you’ve worked with over the years or the impact you’ve had on the gym’s finances. In case you’ve never written one before or just want a refresher, our writing guide can help you put together a strong professional profile and bulk up your resume. 3. Use numbers to show your flexibility. How many total clients have I worked with over the years? What was the age range of my clients? How many classes did I teach per week? What percentage of my clients reached their goals? How long did it take my clients to reach their goals? If you can answer these questions with solid numbers, be sure to include them on your resume. Numbers are your ally because they help establish your competency as a trainer. Would you like to start putting together your resume? 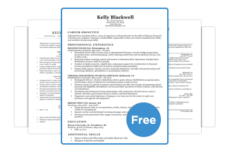 Feel free to download some of our free resume templates. You can also use our resume generator and build your own resume in minutes.